"White sand beaches, nearby deserted islands, great diving, amazing seafood, and a heavy nightlife filled with cheap booze make this spot a favourite among travellers. This was once a very seedy town, but has become a Mecca for backpackers. It�s not a quiet place to hang out, but it�s good place to drink or use as a base to visit the nearby islands, which are quiet and serene." As the newest Cambodian city, Sihanoukville doesn't have a long history like Phnom Penh or Siem Reap. It was founded in 1960 after independence from France as a port, in order to communicate the city with international trade. The project was overseen by the government of Norodom Sihanouk. The beautiful harbour town of Sihanoukville is situated in the South of Cambodia and is surrounded by the Bay of Thailand. No wonder that there are many beautiful sandy or rocky beaches filled with restaurants and bars. Many activities around Sihanoukville are related to the beach. On trips to the islands you can go swimming, sunning, scuba diving, snorkelling or fishing. Downtown Sihanoukville you visit one of the temples or you can go shopping or to the central Market. There are also themed restaurants and bars owned by people from all over the world. There are also a lot of guesthouses, hotels and resorts from cheap to expensive. Noticed: guesthouses (very good) pay less taxes than hotels. 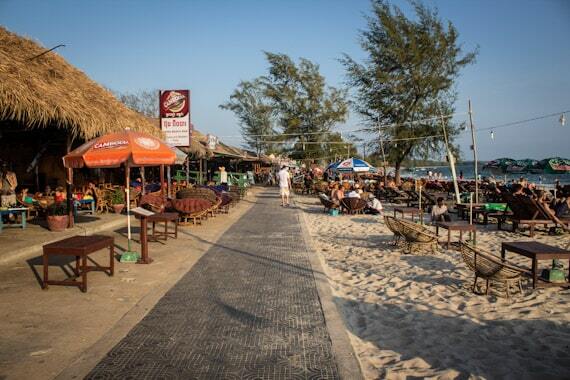 Sihanoukville has become a fast growing holiday destination for Cambodians and foreigners. The best attraction are its beaches and it has become Cambodia's premier seaside destination. The best beaches around town are Ochheuteal, Sokha, Serendipity, Otres and Hawaii beach. Sihanoukville is a big, spread out town. It must be several kilometres, plus windy roads and hills to cover from one end of town to the other part of town. Things are pretty spread out. It could take you several kilometres from beach to restaurant to bar to guesthouse or hotel. As elsewhere in Cambodia, shopping in Sihanoukville is very affordable. You will not find any big shopping centers from there, but there are many small shops and a local market called Psaa Leu, where you can find a selection of Cambodian handicrafts, souvenirs, clothing and food items. 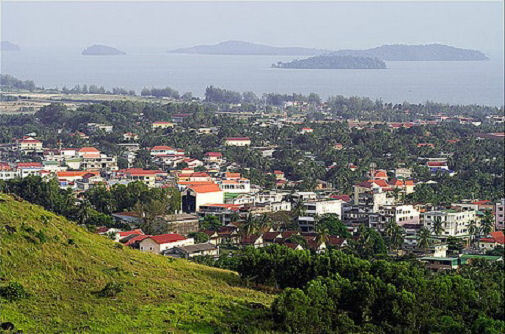 Sihanoukville Mountain is a 132 meter peak just behind the main town area and offers a spectacular view of the city, the islands and the beaches from Otres to the port. Take the hill road from the back of town up the hill to the main road. Turn left and follow the road to the top of the hill about 200 meters past Wat Leu. The Wat Leu is one of five Buddhist temple attractions of Sihanoukville. Because of its hilltop location Wat Leu, is commonly known as "Upper Wat". Wat Leu is surrounded by a beautifully landscaped forest. As you climb down the Sihanoukville mountain pay a visit to Wat Kraom, also known as "Lower Wat". Apart from Wat Leu and the Wat Kraom, tourists can also pay visits to Wat Otres, located behind Otres Beach and the 2 wats in Ream National Park. Another popular trip from Sihanoukville is the waterfall, Kbal Chay. It is favourite by the locals and they return to it time and again. It's just a short ride from town, with clearly marked signs, its easy to find and enjoy. The main beaches are lined with little thatch roofed beach bars and seafood shacks offering cold drinks, beach umbrellas and chairs, seafood BBQ, evening parties and water sports. Ochheuteal and Serendipity Beaches are the most popular and the busiest with plenty of nearby hotels, guesthouses, bars and restaurants. On the other side of town, Victory Beach, is also popular but not as busy, offering a somewhat more tranquil atmosphere. Budget bungalows and guesthouses sit on the side of the hill and the beach you'll find sports, seafood shacks, chairs, umbrellas and even a nightclub. If you prefer to have it more quiet, more green, with waterfalls, rivers, jungle and great river cruises the small town Koh Kong. There are several mini-marts in town where you can get everything from sunscreen to canned sardines, confectionery to tampons, vodka to deodorant, magazines to haemorrhoid cream, and eye-drops to strawberry flavoured condoms. Many of these mini-marts are well stocked, air-conditioned, and open late. More than fifty years ago, when the French Indochina was dissolved and its countries started gaining independence, Cambodia was deprived of a maritime port. So in 1955, the Cambodians built a new port at the province of Kompong Som at the southern coast of the country. This port town was named Sihanoukville in 1964 after King Norodom Sihanouk, the ruling king at the time. Soon enough, this town boomed into a leading beach resort for tourists and foreign expatriates who live in Phnom Penh. These foreigners (perhaps finding difficulty pronouncing the new name), lovingly called it Snookyville or simply Snooky. 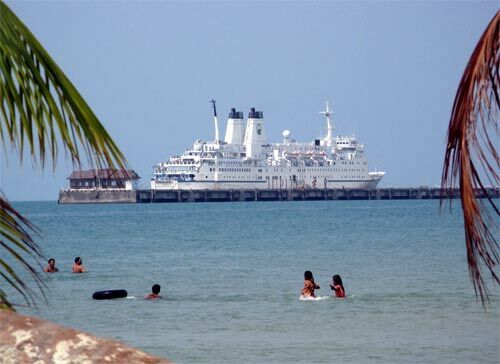 The seaport of Sihanoukville is Cambodia�s main port and an official international gateway. Several international cruise ships dock here for a day or two on their way to Vietnam, Thailand or Singapore. The port of Sihanoukville is located north of Victory beach and is an approx 20 minutes away from the town center. The Kang Keng Airport in Sihanoukville is located 18 km north of Sihanoukville just off National Road No 4. Although several times announced Sihanoukville still doesn't receive any regular domestic or international flights. Several daily busses from Phnom Penh, Koh Kong, Kampot and Kep arrive at and depart from the bus station in Sihanoukville. The bus station in Sihanoukville is located downtown, behind the Freedom Hotel, but you can catch the busses at their respective offices. there are many things to do downtown Sihanoukville. Nearby is the fishing village at Ream National Park. From Sihanoukville you can make day trips to the islands nearby. You can even spend your holiday in the coastal towns of Kampot, Kep and Bokor Mountain, just 2 hours away. Daylight ends around 6pm here, and the vacation continues. Many beach restaurants stay open until the last Restaurants with French, Japanese, Italian, Indian and many other cuisines come to life. Some bars and the casinos are open 24 hours a day. There are a few ways to get around town. While many tourist walk, there are also motorcycle taxi's and Tuk Tuks (carts pulled by a motorcycle) on every street. To get to Sihanoukville, you can take a car or bus from Kok Kong, Thailand. From Kampot or Phnom Penh, a bus or car. And cruise ships and Naval ships regularly dock at the port in town. Flights arrive at Phnom Penh and then it's a 3 hour countryside ride to town. Sihanoukville offers places to stay ranging from $2 a night, to an island resort costing thousands of dollars per day. Most hotels and guesthouses are eitherdowntown, on "The Hill", or on one of several beaches. 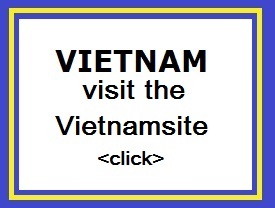 "To drive to the Cambodian Coast from Phnom Penh, head southwest on National Highway 4. The 140-kilometer drive to the junction of Highway 48 takes about 2.5 hours depending on weather conditions, traffic volumes, trucks, buses, tractors, cow crossings, potholes, speed bumps, toll booths, bad drivers, motos, and pedestrians. The highway is a free-for-all with anything that moves using it as a thoroughfare. With few passing lanes, drivers will try to pass no matter whether it�s safe and may occasionally force your over to the shoulder when they misjudge the distance between oncoming traffic. The road is generally good despite potholes and curves that decrease visibility and make drivers more daring. This is one highway where it�s better to be safe and drive slow than be sorry and end up in a local hospital".